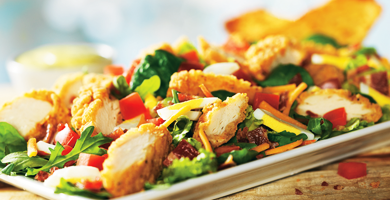 Crisp mixed greens topped with lightly fried chicken breast tenders, hard-boiled egg, tomatoes, cheddar cheese and hardwood-smoked bacon. Crisp mixed greens with cheddar cheese and tomatoes, then topped with grilled chicken breast and fresh cucumber. Crisp mixed greens with tender grilled chicken breast, hardwood-smoked bacon, hard-boiled egg, avocado, ripe tomatoes and crumbled Bleu cheese.